Our fleet of vehicles includes seven 3.5 tonne box vans each with a 500kg tail lift, all of which are able to carry loads of up to one tonne. We also run a 7.5 tonne lorry (1000kg tail lift) able to carry 3.5 tonnes. We stand out from our competitors by having Goods in Transit and Public Liability insurances, rather than the standard Road Haulage Association insurance, so you can be sure your valuable equipment is always safe in our hands. All our vehicles are equipped with state-of-the-art satellite navigation and tracking systems, along with a cloud-based diary system to ensure your deliveries arrive on time and in the most fuel efficient way possible. 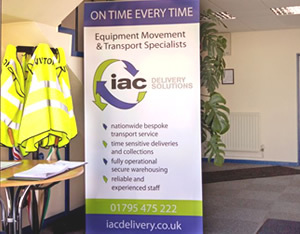 IAC have been formally audited by FORS for our standards of vehicles, management, drivers and operations. We currently hold their coveted bronze accreditation.